All new Redmi 4X got few upgrades over Redmi 3S. 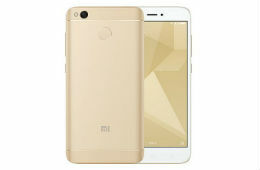 The first notable change is in design, Edges are more cured, speaker grill is placed at the bottom of the phone & availability of 2 new color Cherry Pink & Matte Black which was not available with Redmi 3S, processor is also upgraded from the previous Snapdragon 430 to Snapdragon 435, OS is also not left untouched its upgraded from Android Lollipop to Android Marshmallow rest of the specifications are same. The Smartphone houses a 13MP rear camera with F/2.0 aperture, 5P Lens, PDAF along with LED Flash & 5MP front Camera with F/2.2 aperture for selfie lovers. As of now, we have no information when this smartphone go on sale in India, but we are sure once its available it will become the hottest smartphone under Rs 10,000.